I know I say this everytime I visit Annecy but it really is true...this is a wonderful and interesting medieval town with so many great places to discover, shops to visit, galleries to see and historic sites to enjoy. Not to mention the absolutely stunning freshwater lake surrounded by mountain scenery. Apart from all of these reasons to visit, there is a plethora of fabulous restaurants and cafes to eat in! 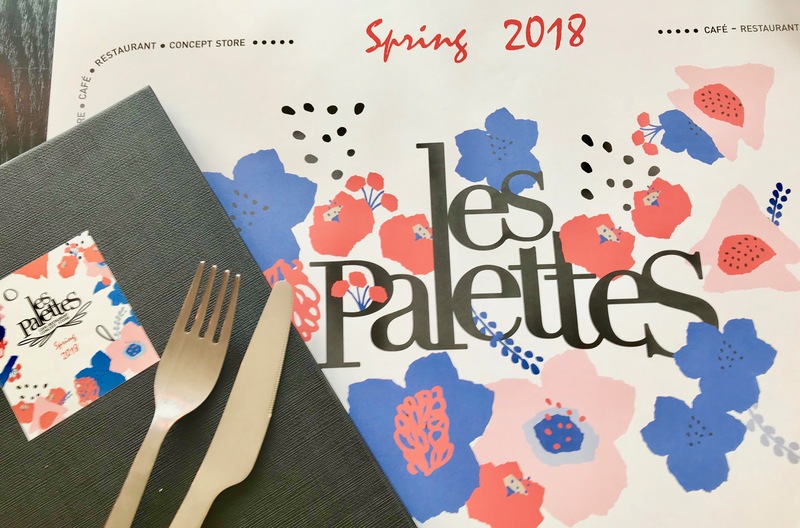 So my latest find is Les Palettes and this is no ordinary restaurant/cafe, it is also a concept store and those who know me well will know that a melange of shopping and eating is my idea of heaven! The 'shopping' part of this quirky place run by Dominique includes a 'vide-dressing' rail which is a selection of pre-loved clothes and accessories. It is a great showcase for handpicked designers offering original new clothes, lingerie, shoes, handbags and accessories. So Les Palettes created and run by Aurore since 2011 is situated in the centre of Annecy in a quiet square - Square de l'Eveche surrounded by beautiful buildings, a park area and a river running through. The concept was inspired by their Parisian cousins 'Colette et Merci', it began as a coffee shop and has grown into a restaurant within the last 2 years. In the summer Les Palettes have a great outdoor seating area. It is essential to book this very popular restaurant for lunch as it is quite a small restaurant inside. The ambience is wonderful, slightly retro, fabulous wallpaper and decor and an open kitchen and serving area where all the homemade food is lovingly prepared by Emilie. The soup menu consists of three different soups all served with a differently seasoned rice bowl and a salad that marry perfectly with the flavour of the soup. Eash dish has a name inspired by Emilie's and Aurore's cultural universe, which is a great personal touch. So by ordering a Camille - pictured above left, you will receive a homemade tomato soup with a rice bowl with pesto and parmesan and a roquette salad with a balsamic vinaigrette. Ordering a Melissa - pictured above right, and you get a corn and sweet potato velouté served with a turmeric rice with bacon chips and a pretty salad of mesclun and flowers. In addition to the original soup menu there is a selection of 3 salads Henri, Suzanne and Madeliene - I chose a Suzanne which is a light and tasty Roquette, parma ham, pine nuts, almonds, sun dried tomatoes and shavings of parmesan combination served with an Italian vinaigrette. On my second visit to Les Palettes I knew I had to try one of the amazing sounding Croque Monsieurs. Well these are Croque Monsieurs like you've never seen them before! There are four different flavour-filled toasted sandwiches with a difference. The Paolo, Loukas, Anika and Raymond. Being partial to Italian flavours, I went for the Paolo - oh my what a lunch! The largest Croque Monsieur I had ever seen arrived with a roquette salad. It was the tastiest toasted sandwich I've ever had! Have you been to Les Palettes in Annecy? what did you think and did you buy anything in the concept store? I bought a pair of fabulous ankle boots! Great recommendation! I am not far from Annecy but get there too rarely to be up on where to go. Will keep this one for lunch next time. Have also followed you on Twitter and Instagram by the way! It really is a beautiful town, lucky to have it so close by! I adore the fact that the menu is named after people – it’s always been a dream of mine to do this (although I can’t cook for myself either). Like you, I love a good cafe gourmand as well and wish they do it in London restaurants! I love Annecy but haven’t been for years! I used to visit regularly – firstly when I stayed in Lyons then later when I was at a conference each year in Montreux – it was my treat! Les Palettes looks fab – maybe it’s time to treat myself again! oh yes definitely worth treating yourself to a Taste of Annecy again!